The body uses all parts of the Vitamin B Complex for different key functions of its electrical, energy-producing cycle — from brain function to digestion to nerve transmission. 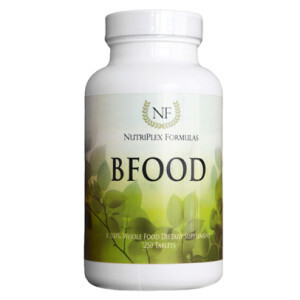 BFood helps refresh, revitalize, energize and heal this system. A deficiency of B vitamins from foods may lead to fatigue, mental & emotional problems, stress & more! Proprietary Blend of Nutritional Yeast, Brown Rice*, Wheat Germ, Sprouted Barley Malt*, Astragalus Root*, Oat Bran*, Beet Root*, Bovine Liver (lyophilized)†, Wildcrafted Fig Fruit, Sunflower Seed*, Vanilla Bean* and Untreated Date Fruit. Inactive Ingredients: Microcrystalline Cellulose, Silicon Dioxide, Hydroxypropyl Cellulose and Croscarmellose Sodium. In addition to the unique properties, synergists and cofactors of this food, each serving provides the following nutrients contained within the above food-nutrient blend (not as isolates): Vitamins A, B (complex), C and E; folate, biotin, choline; minerals including chromium, silicon, magnesium, iron, calcium, phosphorus, potassium, zinc, sulfur, iodine and selenium; many amino acids; whole proteins; enzymes; plant fiber and more. 6 tablets or 1 tsp. of powder daily, or as directed by a healthcare practitioner. In human health, a deficiency in the complex of food-sourced B vitamins has been shown to lead to sustained low energy, emotional problems (vague fears, paranoia, mood swings, attention deficit, irritability, rage, etc. ), PMS problems, anemia, body pain, difficulty concentrating, lethargy, nervous system disorders, hormonal difficulties, heartbeat irregularities and more. Excessive stress, both mental and physical, indicates an increased need for vitamin B found in food sources.